The last week has been a very busy one, with lunch and dinner out for my birthday, a cooking class (Yule log), two cake decorating classes (which I will post about when I get back from my holiday) and all day Sunday baking for work morning tea (cupcake recipes to come soon). And now I am in the middle of packing for a few nights away. As a result, there hasn’t been a lot of extra time for actual home cooking or writing about it. However, I did manage to try two new recipes this week. 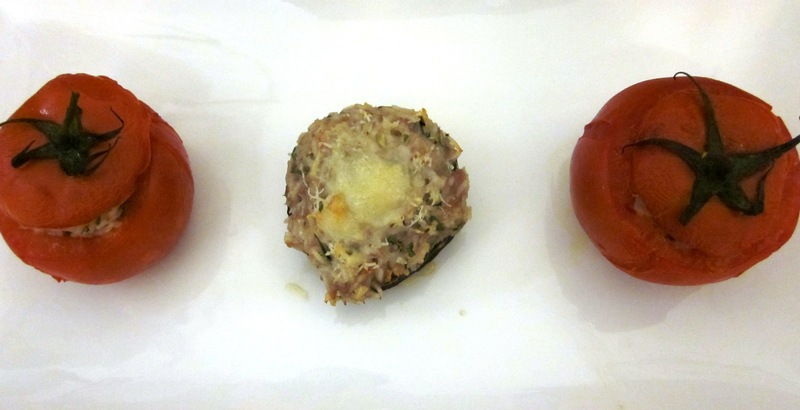 Jerome asked for Tomates farcies (stuffed tomatoes), but with rice in the filling. Normally when trying a new recipe for something specific (rather than a recipe that I see and want to cook), I do some research and look at a number of recipes before I cook, using what I like from each or taking the general “rules” and making up my own. Not having much time, I used the first recipe that I found which was in Manu Feildel’s Manu’s French Kitchen. I was lucky enough to have the book signed by Manu last year. Also in the book was a recipe for baked witlof, so I decided to try both for dinner. I couldn’t get hold of any minced pork at my local shop, so I used the filling of some pork sausages instead. And instead of breadcrumbs and egg I used a cup of rice (as this was what Jerome asked for). I also replaced half of the tomatoes with mushroom cups for a bit of variety. The filling ended up a bit heavier/denser than I would have liked but they still tasted nice – I’m not sure if that is because of the sausage, lack of breadcrumbs/eggs or just me packing it in too tight. My witlof was very bitter and I really needed to keep tasting the sauce as I went to adjust the seasoning and sugar. Don’t put extra in though until after you have reduced the cooking liquid, or it will end up too sweet. The end result was quite nice and Jerome liked it. It didn’t look very pretty in its baking dish though and I’m afraid I don’t have a photo, however I will try it again and update the post with a photo when I have one… After my upcoming trip that is. Preheat oven to 180C (I wasn’t sure if this was fan forced or not, so I heated mine to 160C fan forced and it seemed to work). Trim the bases of the tomatoes if necessary so they stand straight on a tray. Cut off the tops and keep to use as the lids (keep next to the tomato you cut them from so they fit later). Scoop out the seeds with a spoon and discard the seeds). Sprinkle inside with a little salt and place on a tea towel to drain the moisture from the inside of the tomato (cut side down). If using mushrooms, remove the stalks to create a cup for the filling. You could cut up the stalks and add to the onions when cooking if you want. Heat the oil in a frypan over a medium-low heat. Add the onion and garlic (and chopped mushroom stalks after a few minutes if you are using) and cook for 5 minutes until onion is soft and translucent. Allow to cool. Combine pork, onion mix, parsley and rice (or egg and breadcrumbs) in a bowl. Season and then mix to combine with your hands. Place tomatoes (and mushrooms) on a baking pan. Place a small amount of butter in each mushroom cup if using. Divide the mix between the tomatoes (and mushrooms). I grated a little gruyere over the tops of the mushrooms. Place the tops onto the tomatoes. Drizzle with olive oil and place in oven for 30 minutes (until golden and tender). Serve as is or with the baked witlof (below). Preheat oven to 180C (160 fan forced). Remove the outer witlof leaves and chop these and keep to one side. Trim the bases of the remaining whole witlof, being careful to keep enough that they hold their shape. Heat 60g of butter in a saucepan/casserole dish large enough to just fit the 6 witlof. Add whole witlof when butter has started to foam, sprinkle with a pinch of sugar and season with salt and pepper. Cook for 3-4 minutes until golden on all sides. Reduce the heat, add the onion, garlic, stock and chopped witlof. Cover and cook gently for 25-30 minutes until the witlof is tender. Remove the witlof from the pan and drain on paper towels. Strain the cooking liquid through a sieve into a small saucepan. Add the cream and simmer for 8-10 minutes until it has reduced. Taste and if it is too bitter, and a little more sugar. Combine the flour and 15g butter in a small bowl (I wasn’t sure how this was supposed to be done, so I mashed it together with a spoon). Add to the cooking liquid, whisking and simmer for 5 minutes (while whisking) until sauce is thickened and smooth. Remove from heat and season to taste. Wrap each witlof in a half slice of ham and place in a baking dish just large enough to fit all six in a single lager. Pour over the sauce and top with the grated gruyere. Place in oven for 20 minutes until gold and bubbling. 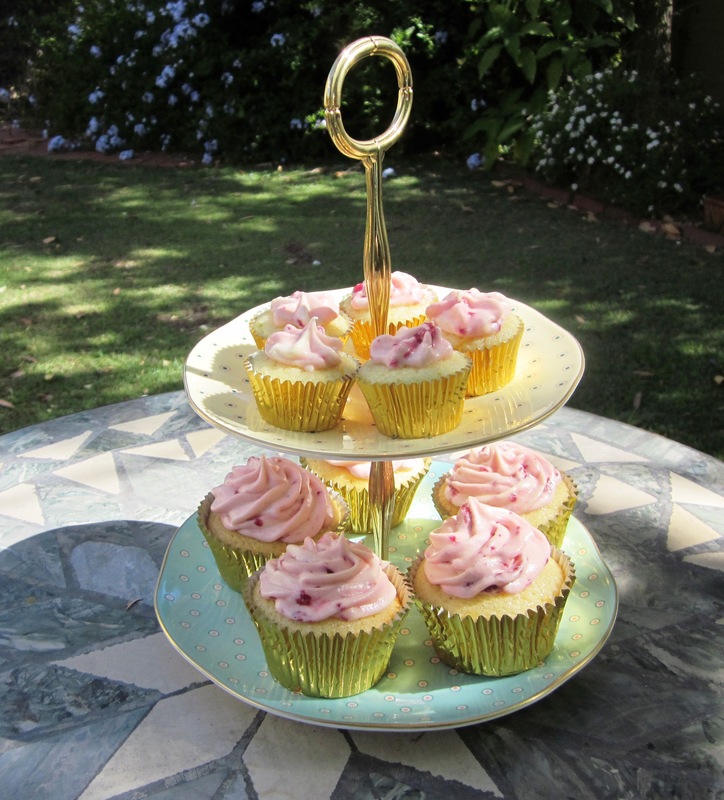 Up next week…citrus coconut cupcakes with raspberry swirl frosting (my favourite) and death by chocolate cupcakes.